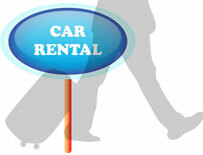 If you like the services of a particular car rental company, no problem! Our company upgrades every year its Crete car rental services and receives customer comments every day complimenting our staff on their commitment and their dedication to meeting needs and fulfilling expectations. Our representatives are friendly, personable, hard working and committed to doing an outstanding job. Our Company is a company that is large enough to meet the needs of any customer but small enough to treat every customer like a good neighbor. If you are not totally satisfied with your car rental Crete we'll make it right. That's our promise to you a 100% Satisfaction Guarantee. Our reliable company has been founded to provide high quality car hire services in Crete island. We are located just a few metres away from Heraklion's Crete airport, so we can provide our services at any destination on Crete island. Check our car hire Crete airport rates. 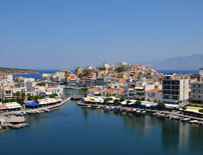 Heraklion is the capital of Crete island, where you can visit Knossos Archaeological site and the Archaeological Museum. There are also plenty of stores for shopping. You can rent your holiday car through our company which cosisted of an experience staff and a variety of cars. 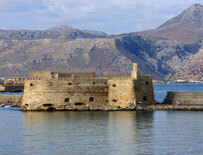 Chania is the second biggest city of Crete island, where you can visit the Archaeological Museum. You may not also forget to visit the Venecian Port. There are also plenty of stores for shopping in the center of the city. You can reserve your favourite vehicle to visit Chania, Crete. Agios Nikolaos is a coastal town on the Greek island of Crete, lying east of the island's capital Heraklion, north of the town of Ierapetra and west of the town of Sitia. 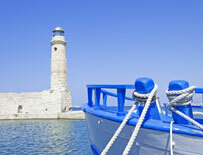 The city is accessible from the mainland and the whole of Europe through Heraklion's airport. Sometimes it's not necessary to spend too much in order to enjoy a good holiday in Crete. You may find our fleet of economy cars very interesting as you can rentl one from only 10 € per day. If you really want to spend the perfect summer holidays take a look at our fleet. Compare car hire prices and don't miss your chance to get our cars at the best prices. 1st - Choose your arrival and departure dates in the form above and click on the button "Search". 2nd - Choose your preferred group by clicking on the button "Book". 3rd - Fill in the booking form and click on "Confirm Booking". There are many places in Crete you can visit by car. If you like beautiful landscapes, you will enjoy your driving experience. Read our travel guide to get the most out of your rental car in Crete. We provide a guide of Crete, including detailed information and reviews on all cities in the province, as well as history, car hire Crete and more. What time is it in all the countries of the world. Online exchange for all the countries of the world. Car rental Crete Network 2014. Rent a car services throughout Crete.